Putting points on the board when working inside of the 20-yard line is paramount for offensive success, which is, of course, much easier said than done. Here, we list the league’s best quarterbacks at making things easier for offensive coordinators in the red zone. It’s no surprise to see that the league’s highest-graded all-around quarterback was also the league’s highest-graded red-zone quarterback. Over the course of the year, including the postseason, Brees completed 76-of-109 red-zone attempts for 438 yards, 26 touchdowns, and zero interceptions. 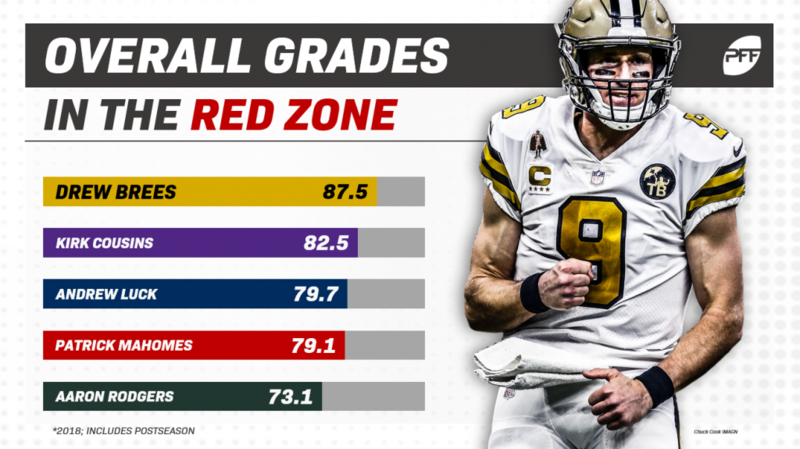 In true fashion, Brees was one of the league’s most efficient quarterbacks inside the opponent’s 20-yard line, as he tallied a completion percentage of 69.7% which tied his own mark from 2007 for the third-best single-season red-zone completion percentage of the PFF era. His 87.5 red-zone grade is the tenth-best grade we’ve ever given to a quarterback. After earning red-zone grades of 61.1, 41.1, and 59.1 in his first three years as the starter in Washington, Cousins underwent somewhat of a red-zone transformation over the course of his first year in Minnesota. Through 16 regular-season games, Cousins notched a 75.0% adjusted completion percentage, a 66.7% completion percentage, a 114.7 red-zone passer rating, and a 9.7% red-zone big-time throw percentage — all career highs — which respectively ranked fourth, third, third, and second among qualifying quarterbacks last year. In contrast from years past, Cousins also did a great job of limiting his red-zone turnover-worthy plays, as only 1.4% of his red-zone attempts were deemed to be turnover-worthy – the league’s fourth-best rate. The Colts’ signal caller was back to his best in 2018, and his work in the red-zone was no different. Including the postseason, Luck completed 71 of his 110 red-zone attempts, while his 507 red-zone passing yards and 35 red-zone passing touchdowns were both second to only Patrick Mahomes. Luck made big-time throws in the red zone at the league’s third-highest rate (8.2%) and tied with Andy Dalton for the league’s sixth-best red-zone passer rating (107.1). Mahomes’ ascendence to the big time wasn’t just underlined by the litany of beautifully thrown deep passes and highlight-reel ‘no-look’ throws, it was also propped up from some great red-zone play. On a league-leading 126 red-zone dropbacks, Mahomes completed 70-of-108 attempts for 514 yards, 37 touchdowns, and just one interception, while his 111.7 red-zone passer rating was good for fourth among players at the position. While his overall numbers are impressive enough, Mahomes’ red-zone numbers from a clean pocket truly shine him in a different light. Mahomes was the only quarterback in the NFL to record an elite clean-pocket red-zone passing grade last year, while his 128.6 clean-pocket passer rating also paced the league. Overall, it was a disappointing year for Rodgers and the Green Bay Packers, but some things did go as well as they once did, namely Rodgers’ play in the red zone. Since 2008, you could make the case that no quarterback has been more consistent in the red one than the Packers’ signal-caller, as he’s the only quarterback to record 70.0-plus red-zone grades from a clean pocket in each of those last 11 seasons. In 2018, Rodgers completed 31 of his 73 red-zone attempts for 240 yards, 16 scores, and just one interception; he ranked second among qualifying quarterbacks in the percentage of positively-graded red-zone dropbacks, at 20.9%, while he was also one of only two quarterbacks (Matt Ryan being the other) who attempted at least 50 red-zone passes and ended the season without a single turnover-worthy play.